If you are an owner of an iPad 2, you know how fragile those things can be. It can easily be damaged, and when so, it is often hard to repair. But luckily, there are many products and information on the web that can assist you. Now, if you’ve got an iPad 2 with a broken or cracked screen, and you already know that AppleCare nor insurance will help, you have come to the right place. But there is one thing that you have to keep in mind. 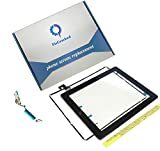 If the glass top of the iPad is cracked or broken, but the image under it is fine then you only need to replace the touch panel, which is what this tutorial is about. But, if the top touch panel is broken and the LCD image is either black liquid or cracked you need a complete screen replacement (touch panel and LCD). Now, let’s get back to the point. As already mentioned, iPad repairs aren’t easy, but with the right assistance, it can be done. Be aware that nobody can be held responsible for any damage done you may do to your device. But, the aim of this tutorial is to avoid that as much as possible. So, let’s end the chit-chat and get to work. This product is one of the best choices for buying a screen replacement. It is good quality, and compatible with most iPad 2 models. The Fix Kit includes replacement adhesive strips, home button assembly, camera holder and iPad 2 Bluetooth/Wi-Fi Antenna. Another nice characteristic of the kit is that it makes installing a front panel a lot easier since the adhesive, front-facing camera bracket and home button are already installed. It comes with high-quality DIY tools, as already mentioned. At an extra cost, you can get almost all tools needed for our repair. So now that you have made sure that you got all the tools needed, let’s begin. First of all, before attempting any repairs you need to power off your iPad. Before we begin our actual repair, let’s first point out some critical areas that can easily be damaged in the process and which you should look out for. This caution area is only for users which have a 3G model, Wi-Fi only model users don’t need to worry about this one. The antenna can be found at the top, running along both sides of the front-facing camera. It can easily stick to the adhesive and be pulled out along with the digitizer. To avoid this from happening, you should hold the antenna down with a pry tool. This way it won’t come up together with the screen. Just like the cellular antenna, the Wi-Fi antenna can also be easily caught on the adhesive and be pulled up with the digitizer while removing it. Even though we will be removing this part and replacing it, you still need to be cautious not to press it too hard, as it can damage the LCD or components underneath it. The cable is located in the bottom left corner of the iPad about 5cm (2 inches) up. The best thing to do is work around it. Now to the actual screen removal, which is the most difficult part, as the screen is held in with nothing but adhesive. In order to remove it easier, we are going to have to heat it up, in order to soften the adhesive and then slowly remove the screen with the opening tool. Heat the perimeter of the iPad for about one to two minutes. This step is the most important one, so make sure you take your time, and not overheat the iPad or anything. You can use a heat gun for this purpose, or a hair dryer if you don’t have one. Now take the opening tool (or a razor blade, which is maybe the easiest way to start the separation process) and gently insert it between the digitizer and the plastic frame of the iPad, right below where the digitizer cable should be. Don’t push the pry tool too hard, or stick it in too much, since doing so you could damage the LCD. If the tool won’t go in easily, heat the iPad up a bit more. Once you got it inserted, rock it gently back and forth in order to break the adhesive around it. After you freed up a section of the adhesive, you can insert a pry tool in that place in order to hold it up. Now you just continue this process, moving around the iPad, taking care not to damage any of the critical areas that we have mentioned. Depending on how bad the screen is cracked, some glass may break in the process, which is not a problem, just make sure that you don’t bend in the direction of the LCD. Also, you may need to heat up some parts once again. Once you have removed all of the adhesive, you can now proceed to remove the digitizer. Carefully lift up the right side of it, in order to swing it to the left side. Make sure no other sections go up with it, if they do, remove the adhesive holding them together. Once you have completely separated the digitizer from the frame, you can go ahead and cut the digitizer cable with a pair of scissors. Before moving ahead, we want to get the vulnerable LCD out of the way and place it somewhere safe. To do this, first, remove the 4 screws in each corner of the LCD using the Phillips screwdriver. Use a pry tool to gently lift the LCD up and get a hold of it, but don’t pull it out too much just yet. The cable is still attached to it. With the LCD lifted in one hand, use the other hand to lift up the clasp holding the cable in place and slowly back the LCD cable out of its socket. Now you can completely remove the LCD and place it somewhere safe. Remove the leftovers of the digitizer cable, by flipping the two clasps holding it in place. Now comes in the dirty work. You will have to remove all the left-over glass and adhesive in the frame since we can’t place the screen unless we clean the frame first. You may want to heat up the frame again, in order to easier remove the adhesive. Once you are sure that you cleaned the frame perfectly, we can move on. Since we have the full kit, we do not need to use any of the parts of the old digitizer (like the home button, camera holder). If you want to, you can replace the old antenna with the Wi-Fi antenna which comes with the kit, but there is no need to do so if it worked properly. Also, since the kid has the adhesive already installed, there is no need to apply any extra. Finally, we are ready to attach the new digitizer to the iPad. Carefully insert the cable of the digitizer into the socket you removed the old one from. It will need to be tucked in beneath the metal frame. If the cable has a white line on each side, you need to make sure to push it in to or a little past the white lines, so that the screen will respond properly. Once you placed the cable into the socket, snap back down the clips that hold it in place. The next step is to put the LCD back in. Just re-attach the LCD cable in the same way that you had done with the digitizer cable. Then replace the 4 screws around the edge of the LCD. Now, before peeling off the backing of the adhesive, this is the perfect time to test the assembly, since we don’t want to continue if it doesn’t work. Gently flip over the digitizer and power on the iPad. Make sure that the screen responds to touch, and that the image is clear. Use the iPad for a minute or two to make sure everything is working normally. If you had any issues double check the digitizer and LCD cable, to make sure they are inserted correctly. If everything is working nicely, you can proceed to remove the adhesive backing, making sure that the digitizer cable doesn’t get stuck. Remove the protective backing off the inside of the digitizer that protects the screen. Gently flip the digitizer in place, making sure to align it perfectly. Use extra caution around the critical areas. Continue working on the frame gently pushing it in place. When you are done, take the heat gun one last time and heat around the frame. Use some protection, like a cleaning cloth, to apply pressure in each section of to secure the digitizer to the frame. Go ahead and power on your iPad. If everything is working correctly, you should be proud of yourself. Enjoy your working iPad, without any scratches or cracks.